Welcome to our blog where the Twinklesteps team is excited to be sharing with you news, ideas, stories & adventures aimed at inspiring young children to enjoy the world of dance, creative movement and ballet. We hope that any parents reading this will feel free to message us with ideas which have helped their children to enjoy dancing and will let us know what they think of our posts by adding comments. Twinklesteps is a little girl who LOVES dancing. She’s also a fairy and has magical shoes which light up and sparkle when she points her toes. She practises her ballet every day, loves adventures, solving problems and making new friends. She is naturally curious, bold and sometimes a bit cheeky! Twinklesteps founder, Yvonne MacGregor, is a registered teacher with the Royal Academy of Dance and has been teaching ballet for over 30 years. Yvonne created the Twinklesteps ballet shoe, to inspire and motivate young dancers to stretch right to the end of their toes, when practising their dancing. Imagination and play is a wonderful way of encouraging young children to enjoy dance & the delights of ballet so it’s no coincidence that fairies and ballet often go hand in hand when it comes to inspiring young children to dance. There’s a magical quality about ballet: the beautiful costumes, the storytelling and the other worldly feel of watching dancers move so gracefully, so the magical world of fairies is an ideal theme to introduce children to creative movement and basic ballet steps. With that in mind the Twinklesteps character was developed as an inspiring role model to encourage younger children to dance. The Twinklesteps sparkly play shoe is in progress, as is the Twinklesteps ballet shoe. 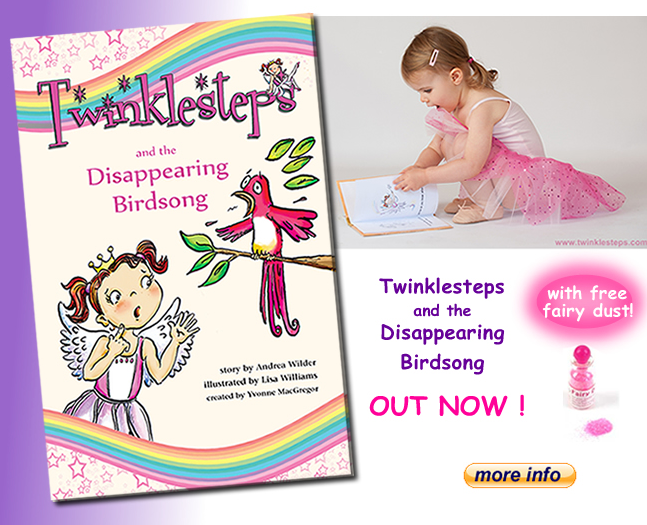 Our brand new magical ballet adventure book “Twinklesteps and the Disappearing Birdsong” is also almost ready to launch, a book we very much hope will inspire young readers to give dancing a go or motivate young dancers to improve their skills. At the very least we hope it will be a book which transports young readers into a magical world which they’ll very much enjoy exploring. You are doing great things! Thank you! I read your answers and enjoyed them 🙂 the pictures were adorable!